WASHINGTON, DC, June 29, 2011 (ENS) – An elevated, electric rail line connecting communities on Oahu’s south shore with the Honolulu International Airport, downtown Honolulu and Waikiki, is one of more than two dozen transit projects that will receive federal funding this year, Transportation Secretary Ray LaHood announced Monday. The Obama administration has selected 27 transit projects nationwide to receive $1.58 billion under the New Starts program through which the Federal Transit Administration provides support for major capital construction projects such as subways, light rail, streetcars, and bus rapid transit. The goal is to improve sustainable transportation for millions of people while reducing dependence on oil and curbing air pollution. 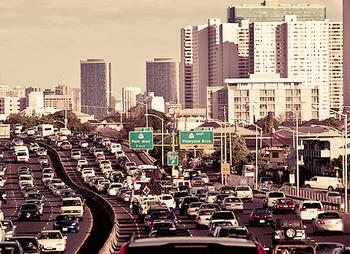 The Honolulu transit project, the westernmost one, will receive $55 million, one of the smaller chunks of funding. The largest single amount, $215 million, will be spent on the easternmost project. The New York Metropolitan Transportation Authority’s Long Island Rail Road will build a new, direct 3.5-mile commuter rail extension connecting Long Island and Queens to Grand Central Terminal on Manhattan’s East Side. The project involves tunneling under rail yards and subway lines and constructing a new passenger concourse at Grand Central. The current highway system as well as bridges and tunnels spanning the East River to Manhattan from Long Island and Queens are at capacity and subject to severe congestion and long delays. Expansion of the highway network is not possible due to lack of available rights-of-way, high costs, and potentially adverse environmental impacts in a severe nonattainment area for ozone. “Our investments in expanding America’s transit networks will not only improve reliable transportation access for communities across the country, they will support construction jobs and economic development,” he said. In Denver, Colorado, the Eagle Commuter Rail project will add more than 30 miles to Denver’s transit system and connect the downtown area with Denver International Airport to the east and the communities of Adams, Arvada, and Wheat Ridge to the west. The new grant announced Monday for the Denver project is $80 million, but it is only one part of Denver’s much larger FasTracks program, a multi-billion dollar, multi-year transit-expansion effort. The Federal Transit Administration will contribute $1 billion towards FasTracks on July 1. In Minnesota, the FTA will provide $45 million towards the Central Corridor light rail project that will connect Minnesota’s two largest cities – Minneapolis and Saint Paul – by light rail for the first time. In Washington, the FTA is offering $110 million towards a light rail transit extension from downtown Seattle to the University of Washington, three miles to the northeast. In Texas, a bus rapid transit project in the capital, Austin, and two light rail transit projects in the state’s largest city, Houston, will receive a total of more than $175 million. Click here for a complete list of the 27 projects receiving New Starts funding allocations for 2011.